I’m linking up again this month with Amanda at The Lady Okie and Becka at Sunshine To The Square Inch for their Runner’s Tell All monthly linkup. Be sure to pop over to their blogs to see what they have to say on today’s topic, and to see who else is linking up. My husband Bill started running my longer training runs with me to keep me company and before he knew it, he was up to 16 miles. One day I saw a new marathon in our area and decided to sign up for it. He was at work when I called to see if he wanted me to sign him up. He answered his phone, said something like, “Sure that sounds good” and hung up. When he got home that evening he asked exactly what he’d committed himself to! Four months later, we ran Marathon in the Parks together and he was hooked! 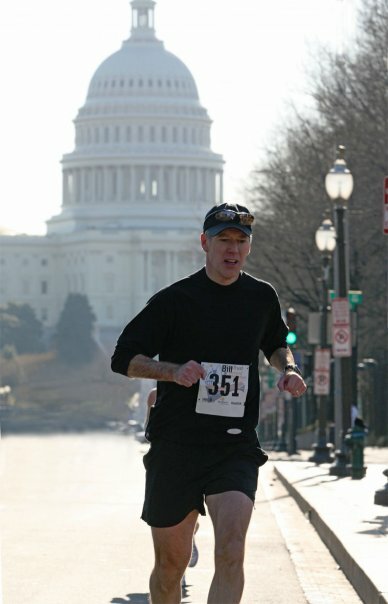 Today he’s got about 20 marathons, 11 half marathons, and lots of shorter races under his belt. We have an interesting history as a couple. Back when we were first married, we were totally incompatible; when running, that is. I preferred to go out and run three to five miles at a slow and steady pace, and Bill preferred to run short and fast whenever I talked him into running with me. He was on a church league basketball team, and played lots of tennis; so he didn’t need to run to keep fit. What he needed for his two sports was the ability to run short distances at a very quick pace. Our infrequent runs always resulted in me complaining that he was running too fast, and Bill complaining that I was running too slowly. 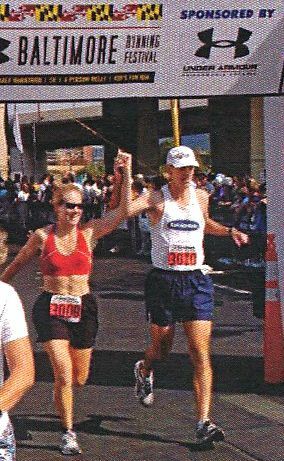 After those first couple of years of marriage, we quit trying to run together – until I started running marathons. I’m not sure if it was Bill seeing how much fun I was having running marathons, how much time I was getting to spend with my friend Miles out on the running trails, or if he worried about me going out for some of my long runs alone, but Bill started running with me occasionally. Our sons were now old enough for us to leave them alone for an hour or two while we went out on our runs together making big laps in our neighborhood. 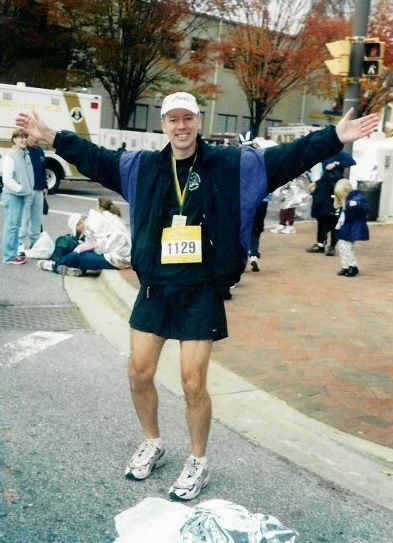 In the spring of 2000, Bill made it up to 16 miles with me; and guess what, we were having a ball together! Running together gave us time alone, time to talk without little ears overhearing our conversations, and time to do something that we both enjoyed immensely! 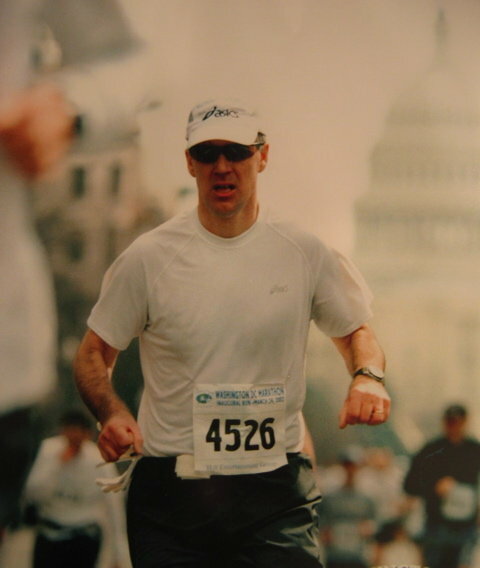 Yes, Bill had surprisingly fallen in love with the sport of running; with my sport. He was running so well and having so much fun, that I made that now infamous phone call to him at work to see if he wanted me to register him for the new marathon that I’d just read about. Since his first marathon, we have run thousands of miles together… Many of those miles were just the two of us, many were with the Cruisers, and many were with Miles. We logged those miles both in training runs and at races. We are a team, and we were the original Cruisers. 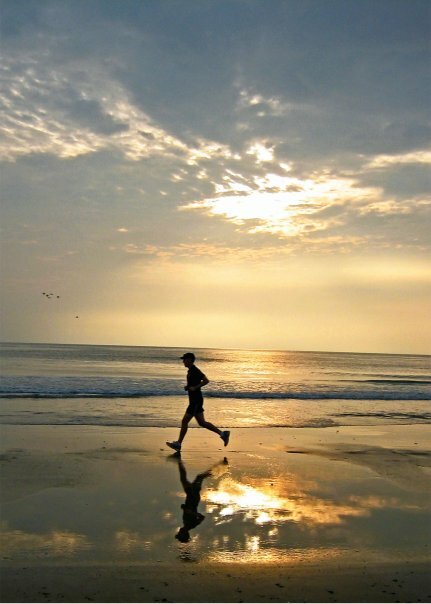 These days our vacation activities tend to revolve around what time and where we’re going on our run. Bill has been known to scout out a good running trail or route for us before we leave. He can get downright grumpy if he gets too busy at work to get his runs in. And that’s why you’ll find us running almost every day while on vacation – because we have time to run together, and being together is so fun and so important. Yes, you’ve seen me posting lots of running pictures of the Cruisers, my MRTT friends, and my BRF, but my favorite person to train with would have to be my hubby! Who’s your favorite training partner? What common interests/activities do you have in common with your loved ones? 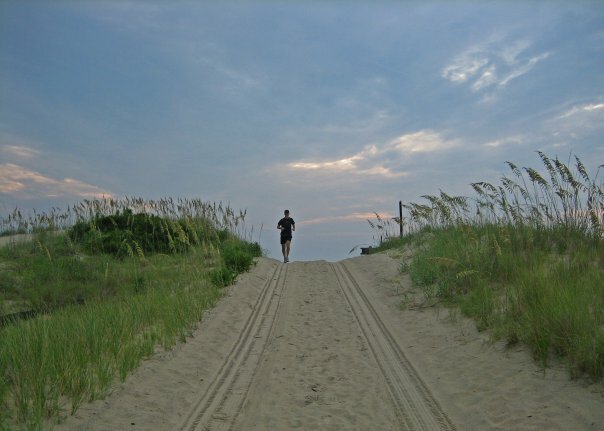 Runners: Would you rather run with other people or alone? 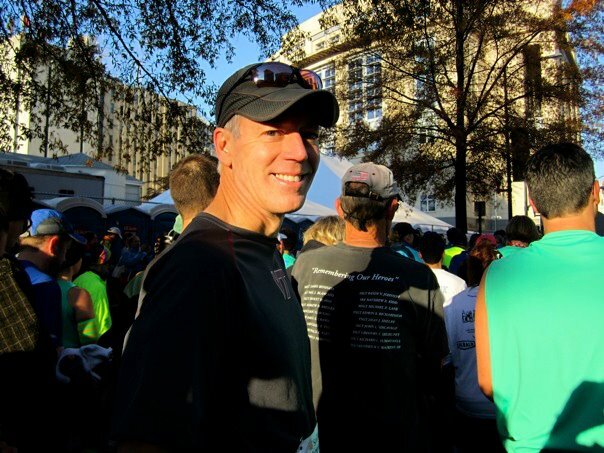 Previous Runner’s Tell All Linkups: My Running Story In 250 Words, Favorite Running Gear And Products, My Proudest Running Moment, and What Goes In, Must Come Out. I love this post and all the accompanying photos. Glad I had a chance to meet Bill as well! Jennifer recently posted…Tasty Thursday – Canadian Edition, Ey! We only run together on vacation or on holidays as we run different paces. But at those times, we’re likely only doing shorter easy runs “for fun” and not on a training plan. Cool that you got him into it and now it’s a “thing” for you two together! Relaxing runs with Bill while we’re on vacation, are some of my most enjoyable run. No pressure, just kind of sight seeing runs. Sounds like the kind of runs you and your husband go on. I love that you run with your husband! My husband and I have tried on multiple occasions to run together and just finally figured out how to do it without fighting (ironic, huh?). Glad you and your husband have figured out a way to run happily together. i love this. one of the main reasons i want to get faster is to run with my husband. we both run long, but at different speeds. in high school during the summer i babysat for a family every morning for an hour while the couple ran. i thought it was such a neat thing for a couple to share together. Can I just say how much I love that you babysat for a couple so they could run together! Not only was it great for the couple, but they were setting a beautiful example for their children and you that fitness and time together was very important to them! Love it, and thanks so much for sharing that story! I love your story! That is so neat and encouraging to hear that you and your husband run together. What a wonderful way to enjoy life together. My husband and I are like you and your husband were. I am a distance runner and he is a crazy fast runner. However, my husband is super nice because for my half marathon he ran with me (without training for it) and did great! He still says he prefers shorter distances so maybe I’ll just have to get faster. Thanks so much for linking up with us and for sharing this wonderful story about your and your husband. Thanks for providing the linkup, Beka! It’s great that your husband ran a half with you. Love your post! My husband and I both share a love for running, and I can attest it’s been a great way for us to bond. We haven’t been running together nearly as long as you two, though–hope we remain as committed to that mutual love the sport as you have. Here’s hoping you enjoy many, many years of running with your hubby! My Boyfriend was the one who got me started on running, and I love running with him! This gives me hope 🙂 Jordan hates to run, and I keep wishing he would start liking it so we could run together. Maybe after we’ve been married a while, he’ll start liking it! I bet it’s so special to be able to share something like this with your husband, and I love all the pictures! This post is so great. Here’s to hoping Jordan decides he likes to run one of these days! Amanda recently posted…Runners Tell All Linkup: Where I Take You Running with Me! Also, thank you for providing the linkup, Amanda! Can I first say that I can’t believe Marathon in the Parks goes back that far? I remember the first one and still love the half. Anyhow..love that you two run together so much. It is a great way to spend time together. My husband and I used to log some miles together but he doesn’t really care for running. We need to find something we both like to share! We ran the first five years of Marathon In The Parks until they stopped holding the event. I’m not sure if they switched over to a half marathon the next year, or if there were a few years in between the two events. We were pretty much only running fulls back then, so we never signed up for the half. Bill and I love that course, so we should consider running the half one of these years! That’s good to hear! I googled some recaps so I could find out more about it, and yours was one I came across…sounds like it was a great time! I’m so excited for it, I love love love fall running! I’m from coastal VA and never ran hills before a couple months ago when I moved back (except for a hilly half I ran in Raleigh last year – that was a fun surprise!). That’s a great story about how y’all ended up running together! When Barry and I first started dating I was actually the faster one. He hadn’t run in 4 years and I was coming off of high school sports. Now a days he is dramatically faster than me, but occasionally we will run together 🙂 It’s definitely a great way to spend time with the person you love and to get to talk to them. I feel like a lot more gets said when we’re out on a run together than it would sitting at home, because you mind just thinks of all kinds of things while your feet are moving. I feel spending time together on a run really is quality time.